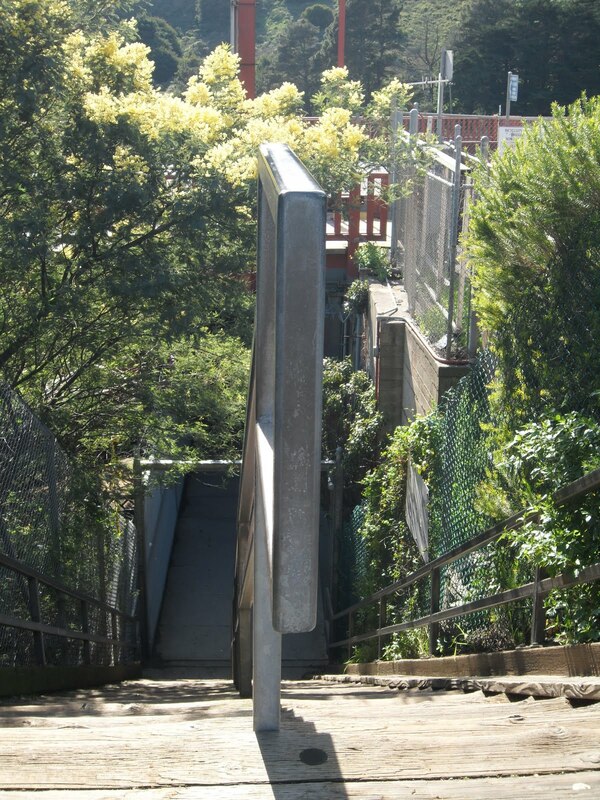 Difficulty = An unfit tourist could do it . . . so can you. 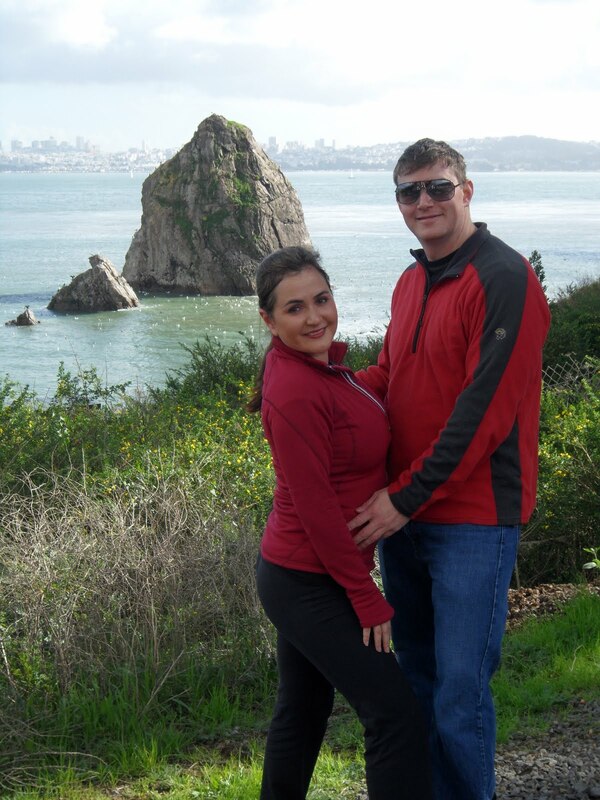 We resume at the end of Crissy field where you must ask yourself whether you’re the kind of person that removes a band aid by ripping it off or peeling it slowly . . . This kind of logic will help you decide which hill you climb up to the bridge. 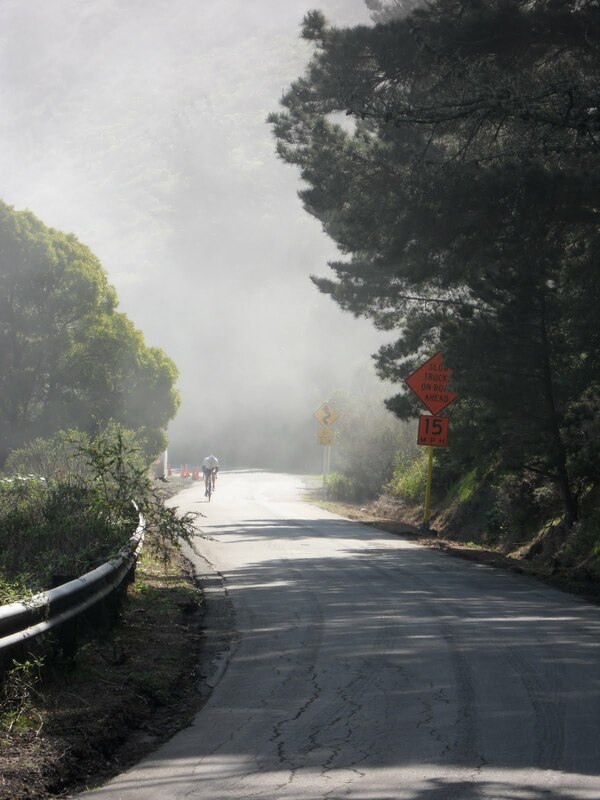 The Stab Wound hill is a short, sharp, steep pain in the saddle, but if you like to get your suffering over with quickly (or like to “challenge” your inner bike douche) this is your best bet. 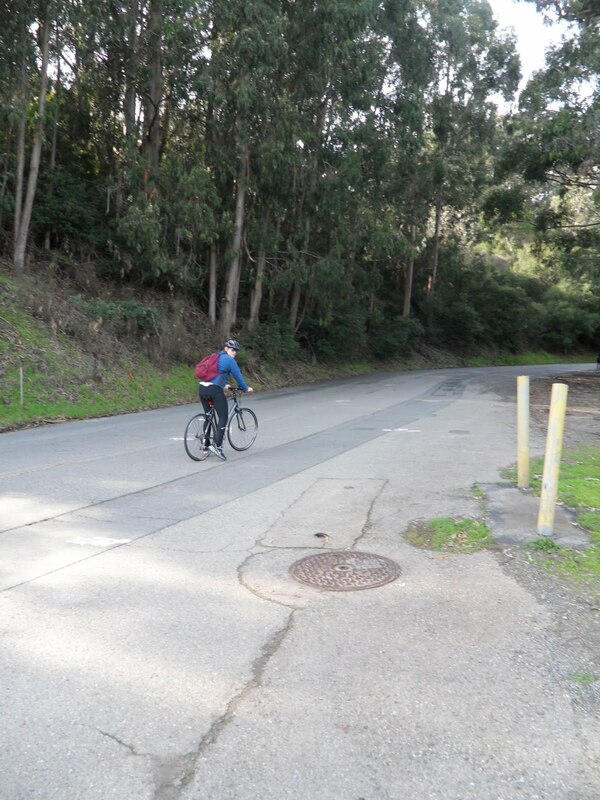 Know your limits though, this hill is narrower and likely fraught with traffic so walking your bike is less of an option. 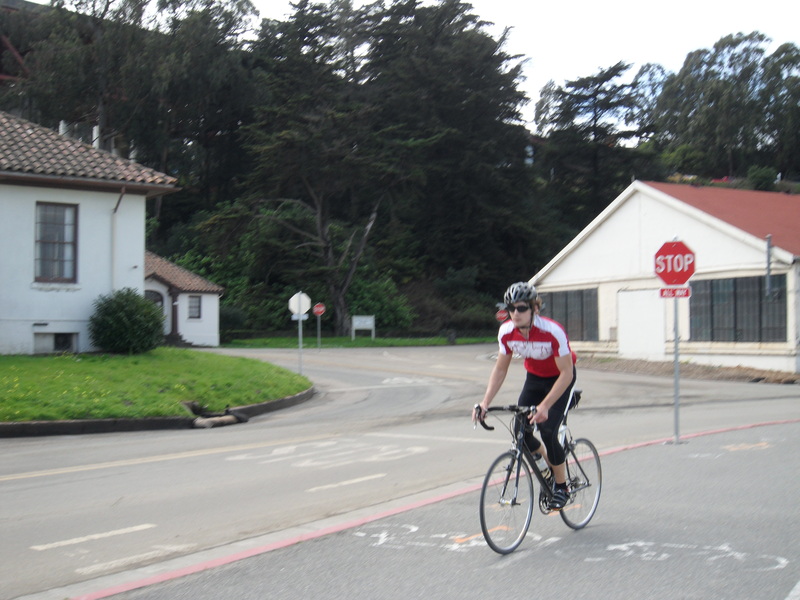 Turn off Crissy Field Blvd at the Lincoln Blvd stop sign. The less “deadly” option, Black Eye hill, is a punch in the face but actually looks a whole lot worse than it feels. 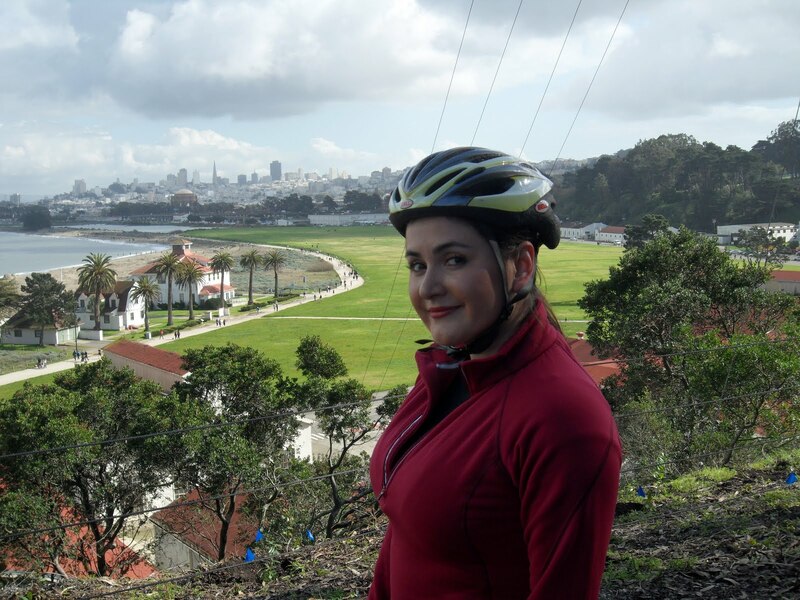 There’s no shame here in walking your bike or being overtaken by a jogger or puppy . . . OK that was admittedly humiliating. 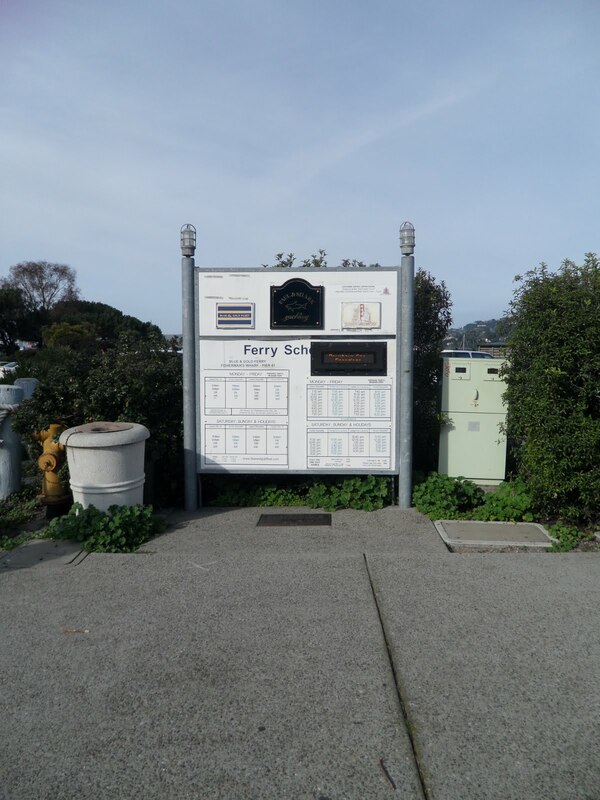 Find it at the end of Crissy Field on Long Ave which intersects with Lincoln Blvd. At the top is a sweet picture opp and perhaps time for a water break? 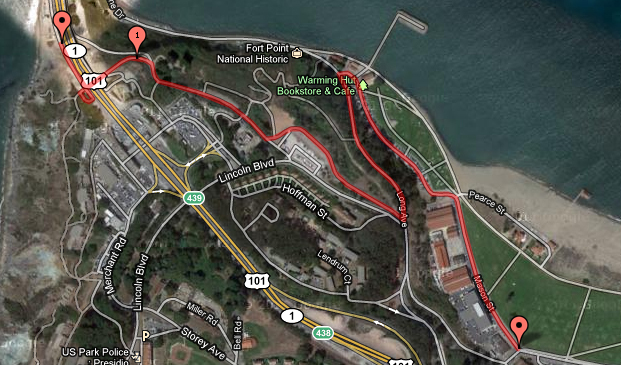 You’ll need your strength for the final climb up to the Golden Gate Bridge. 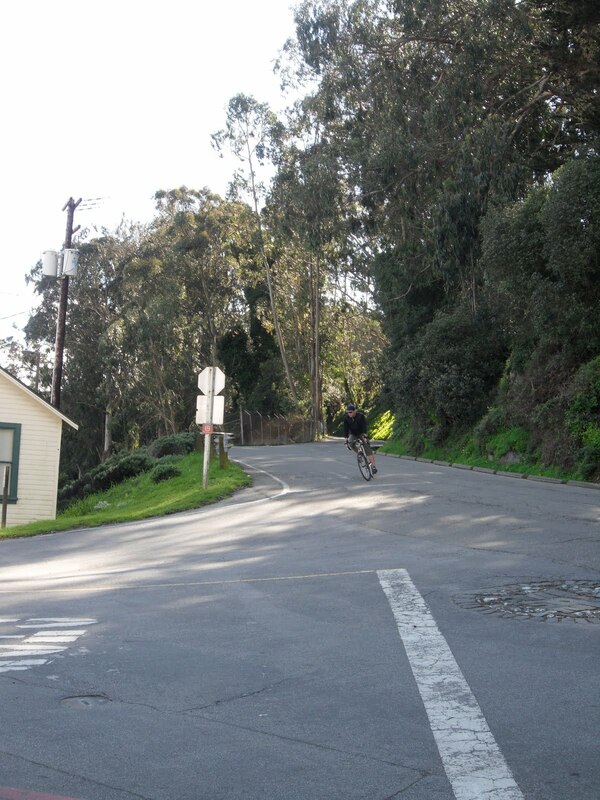 (You can see bikers biking uphill behind Jon here.) 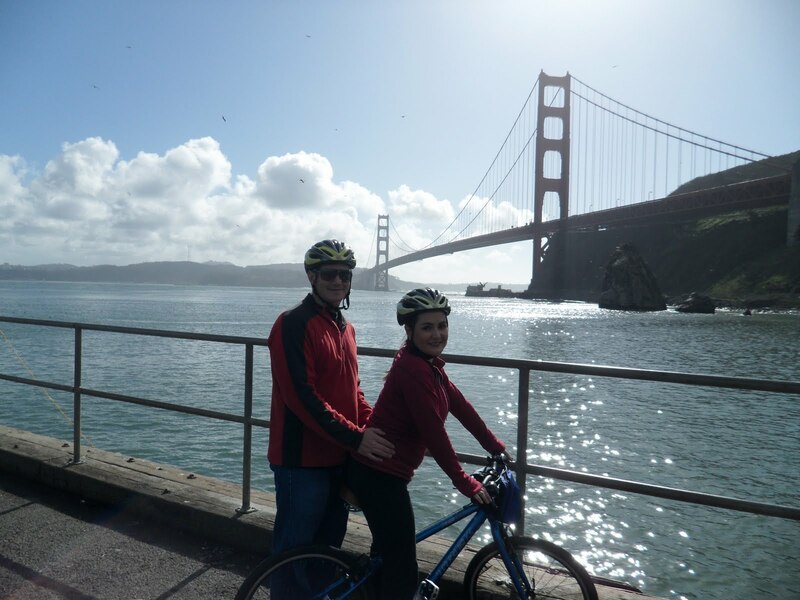 This takes you directly to either side of the Golden Gate Bridge. For the East (pedestrian) side take a left at the striped poles, up the wooden fenced walkway . . . or just follow the tourists. For the West (bike only) side continue on the path under the bridge which will wind its way up to the bridge. 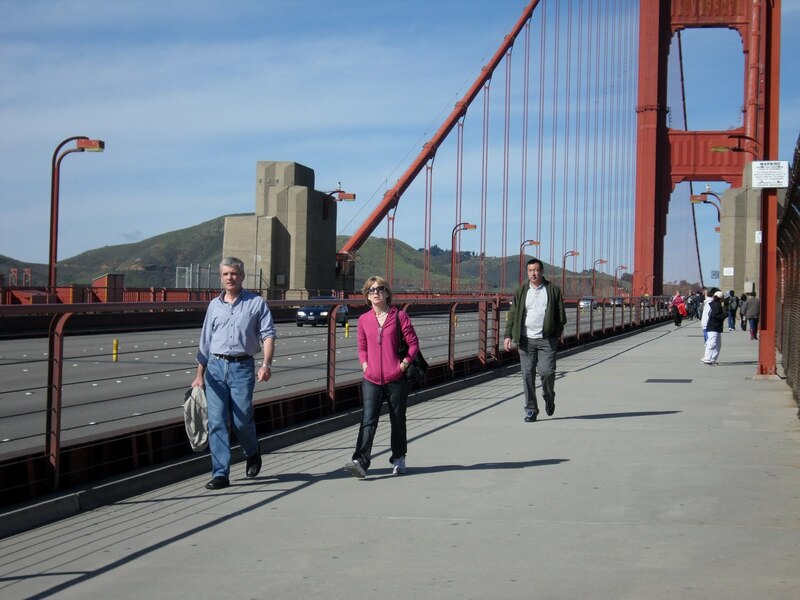 Eastside vs. Westside : Which side do I cross the bridge? 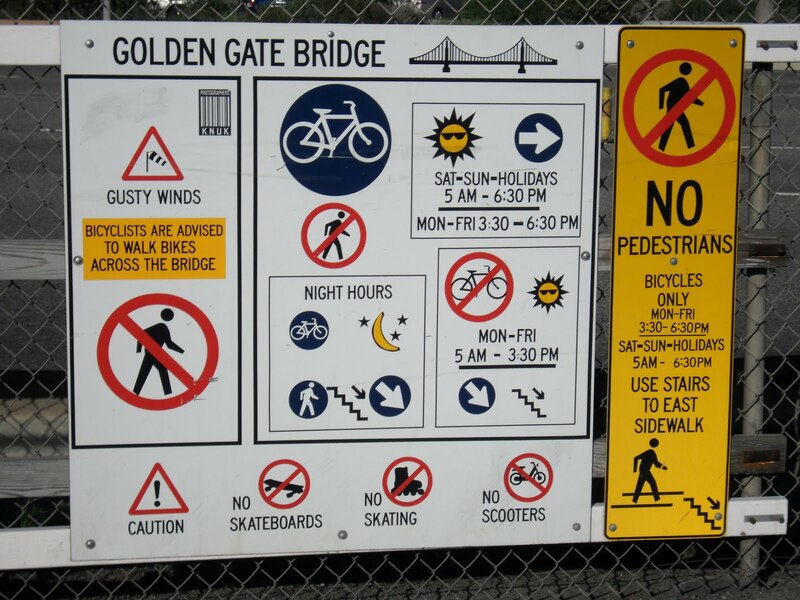 The cryptic symbols on the bridge’s signs indicating the hours for cycling across the different sides are practically hieroglyphic and as such make no sense to the literate. The EAST is the side shared with PEDESTRIANS . . . which is an experience akin to driving through a heard of blind sheep. On the up side, this is the side to stop and take your pictures and your time. If you feel you may need to walk your bike use this side only. 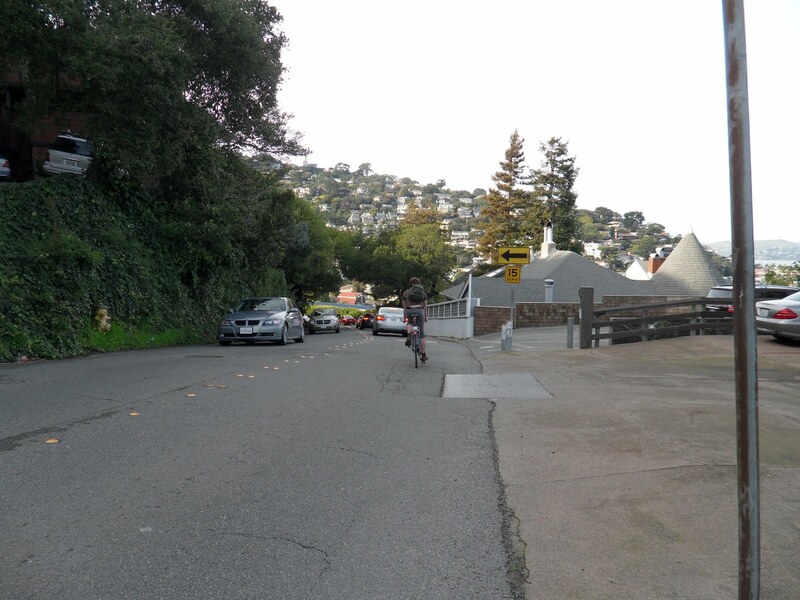 As for your frustration tolerance taking this route during the week try to remember that this is a pedestrian designated walkway and most aren’t expecting bike traffic. Deep breaths and hum the words to your favorite song inside your head. 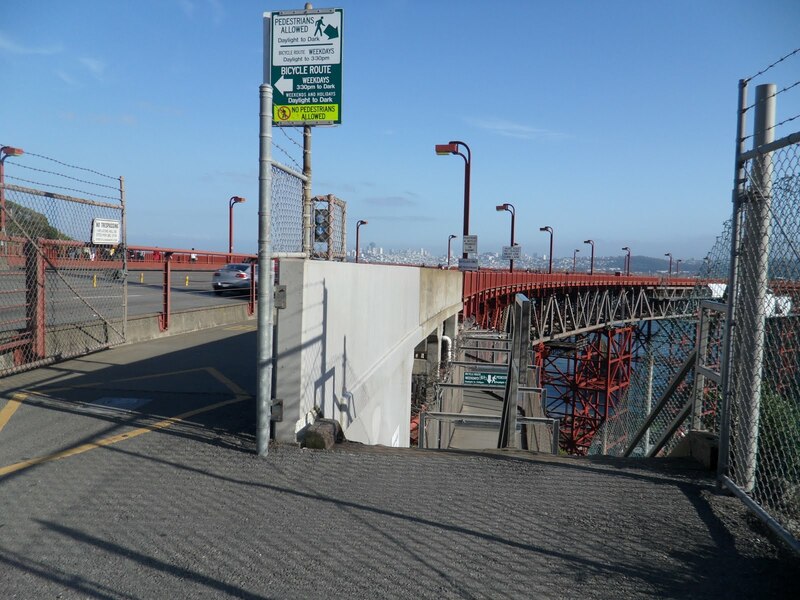 The WEST side is reserved for BIKES ONLY . . . which the bike douches (see definition) have claimed as their own, race through at alarming speeds and treat as their training ground for whatever “Tour” they hope to race in (or just Tour de Douche for short). It is fast, exciting and highly efficient. 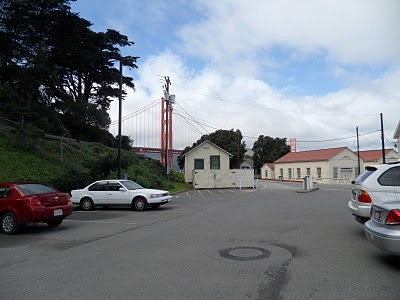 It is also dangerous and frightening at times, with frequent passing and tight turns around the tower. While a spectacular day may merit a brief pause or perhaps a picture or two, it’s not recommended except in areas where there’s wide clearance where you will cause minimal obstruction to the through traffic. Just imagine that you’re about as convenient as someone stopping in the middle of a highway to do so – use your judgement. 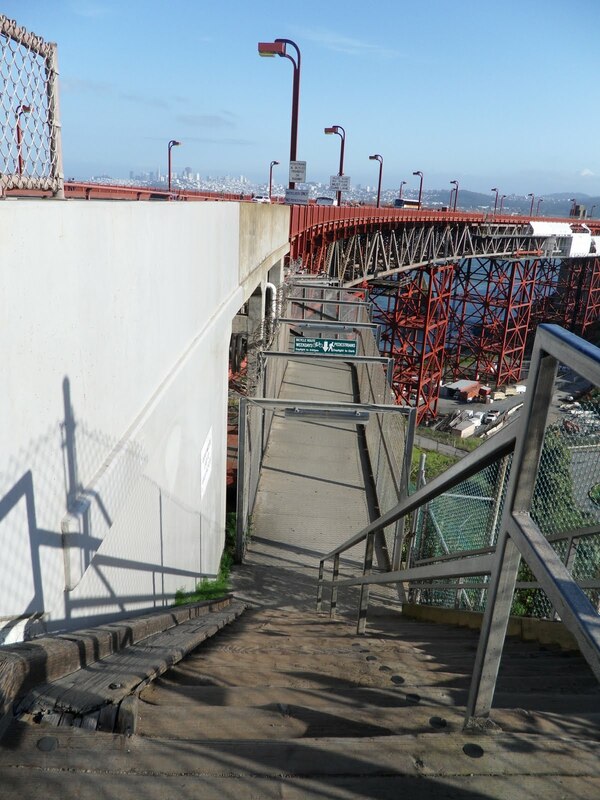 Stairs at either side are available for cyclists to cross underneath the bridge to chose which path to take into Sausilito. The twisty hill below that looks like a “NO WAY” is in fact the way down. Beware of the masochists cycling upwards, bizarre pedestrians looking lost and needlessly fast drivers charging up as you cycle down at “Weeee fun!” speed. At the bottom views of the city and rock formations will only add to your thrills and picture album. 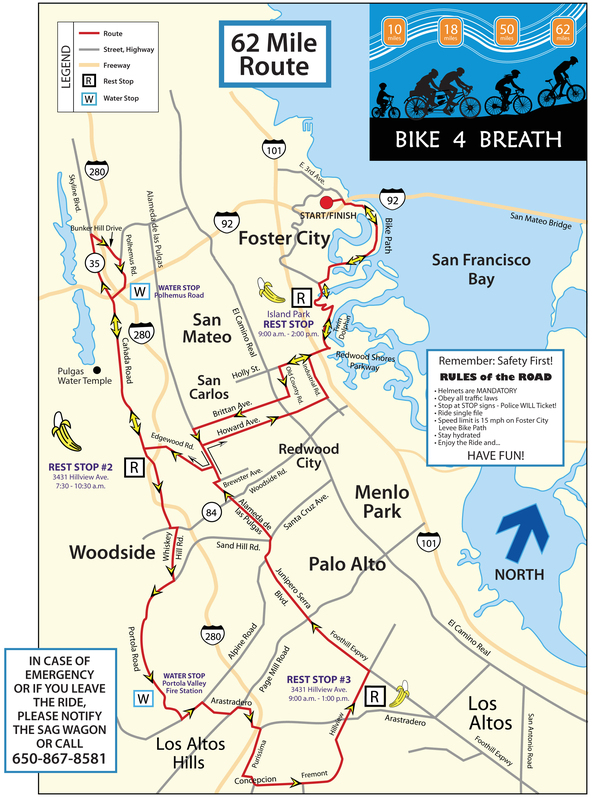 As a rule in biking what goes down must come up and the thrill of the downhill is matched by the payback of the uphill – which begins after Horseshoe Bay and the Bay Area Discovery Museum up East Road. 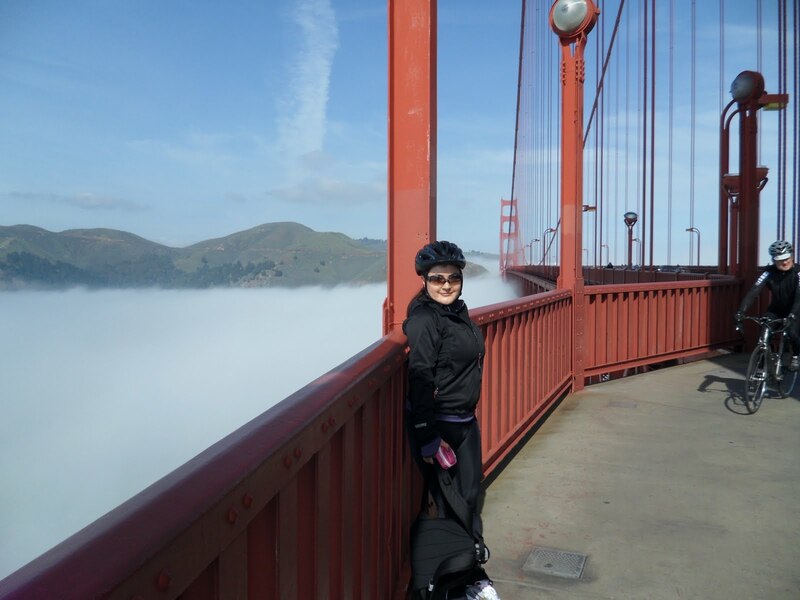 The sheer number of scenic spots to admire the view from the other side of the bridge make the hill climbs into Sausalito worth the huffing and puffing. 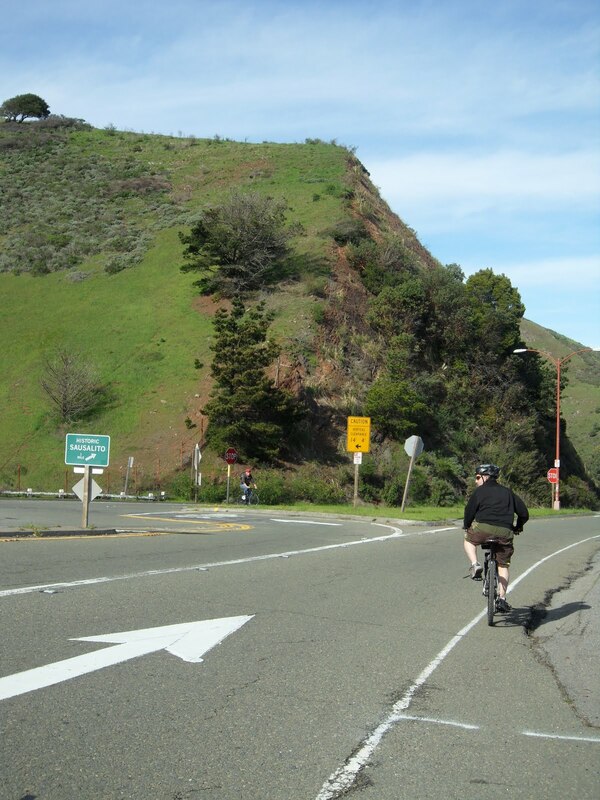 The climb continues along the coastline until reaching the crossroads into Sausalito. And it’s all downhill from there . 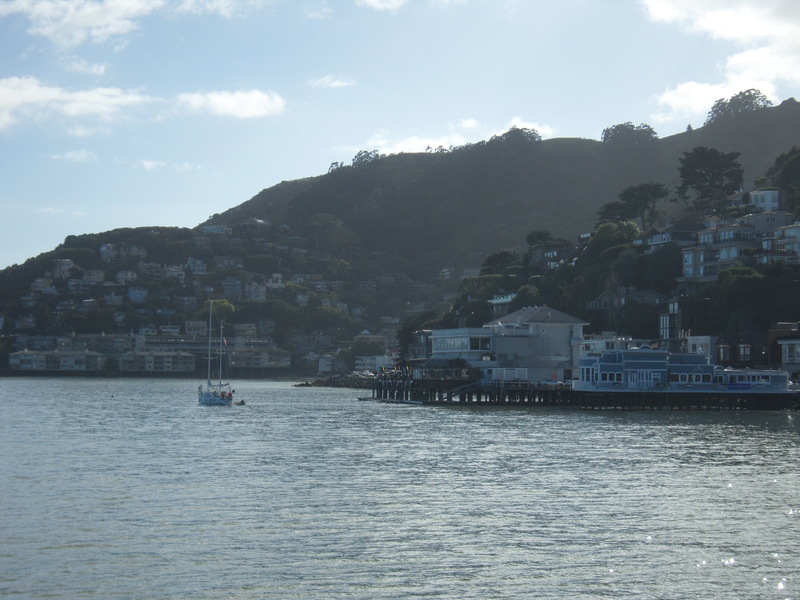 . . and pure thrills into the town of Sausalito. 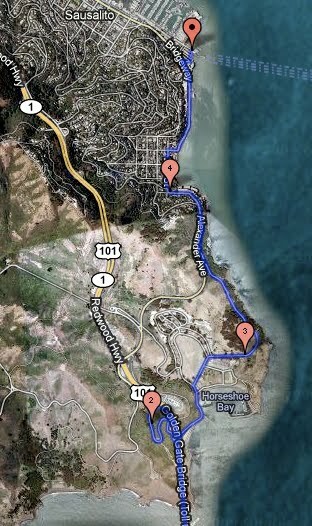 For a detailed look at this route consult the map for the FULL OH SO SCENIC ROUTE on gmap-pedometer.com. 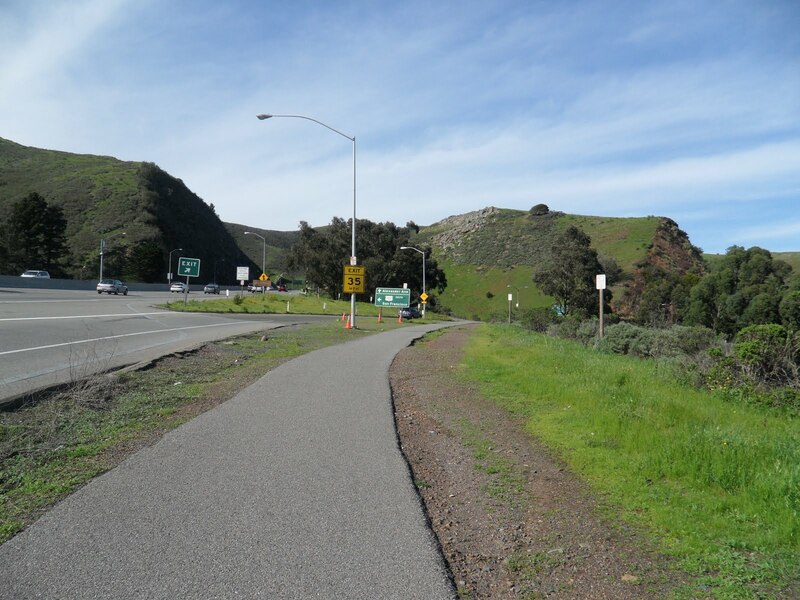 Off the East side of the bridge or from crossing underneath head towards the hills, literally, and follow the clearly marked bike path towards the highway. Follow the road signs for Alexander Avenue. 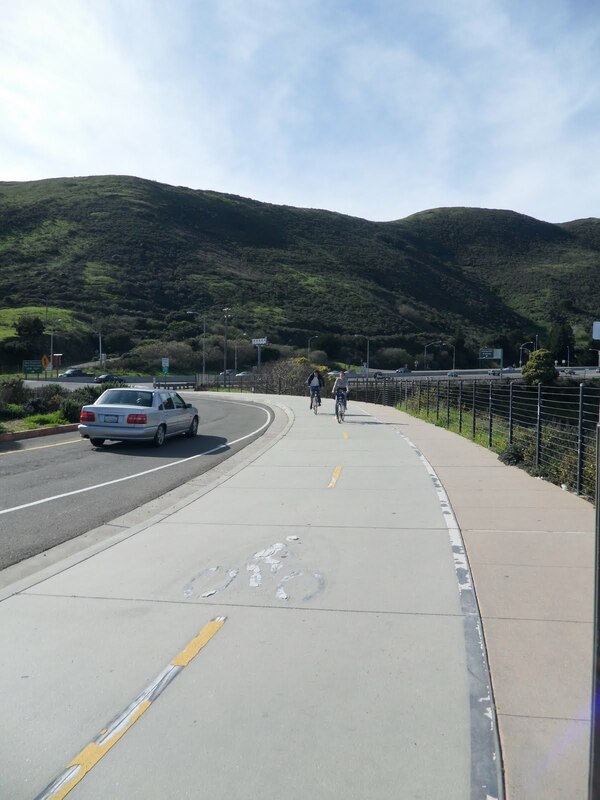 The bike path lines you up directly beside the highway and the exit for Alexander Avenue. 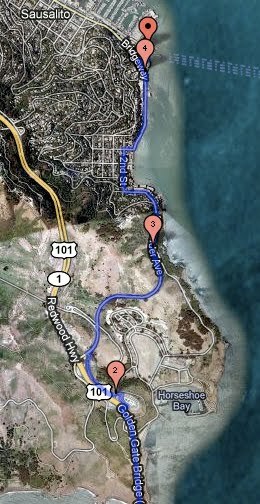 At the end of the bike trail there’s a messy merge onto Alexander Avenue where minding the oncoming traffic may mean the difference between eating hamburger in Sausalito and becoming hamburger on the way to Sausalito. Hug the curb as closely as you comfortably can and saddle up for some “weee!” fast fun. 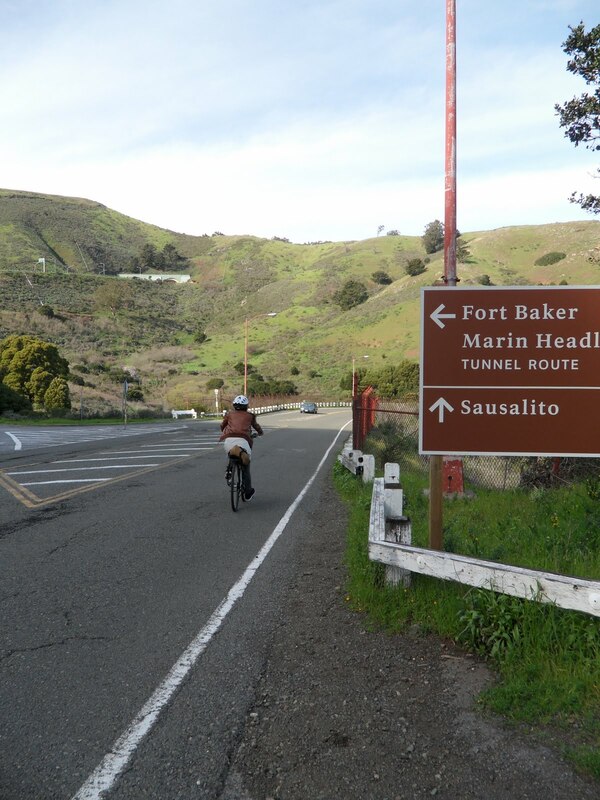 Continue to follow the signs to Sausalito . . . unless you want to end up somewhere else. 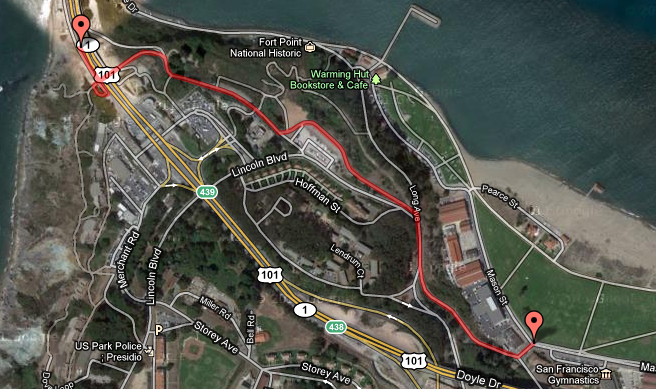 For a detailed look at this route consult the map for the FULL WEE FAST FUN ROUTE on gmap-pedometer.com. 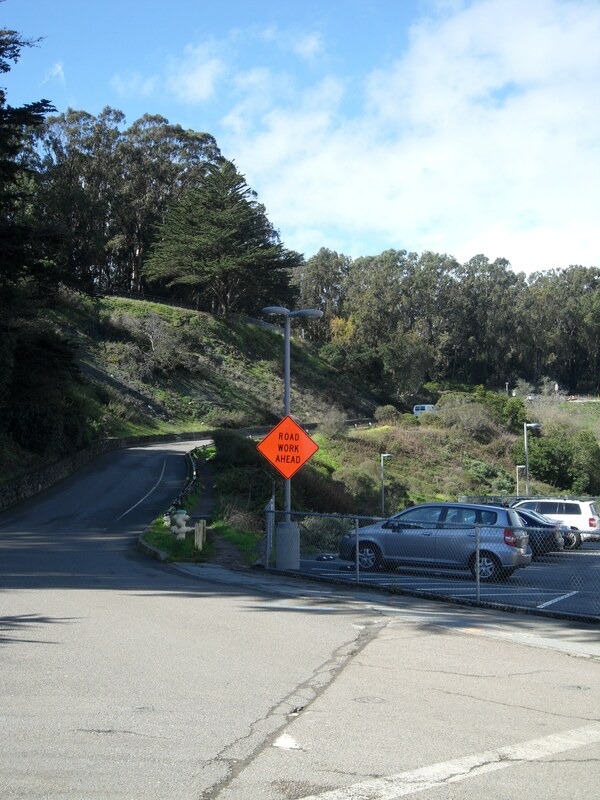 The hill into the town of Sausalito is steep and the two way traffic is constant on any given day. At the bottom there is a four way crossroads marked “SLOW” that could put your wee fast fun pace at a halt. 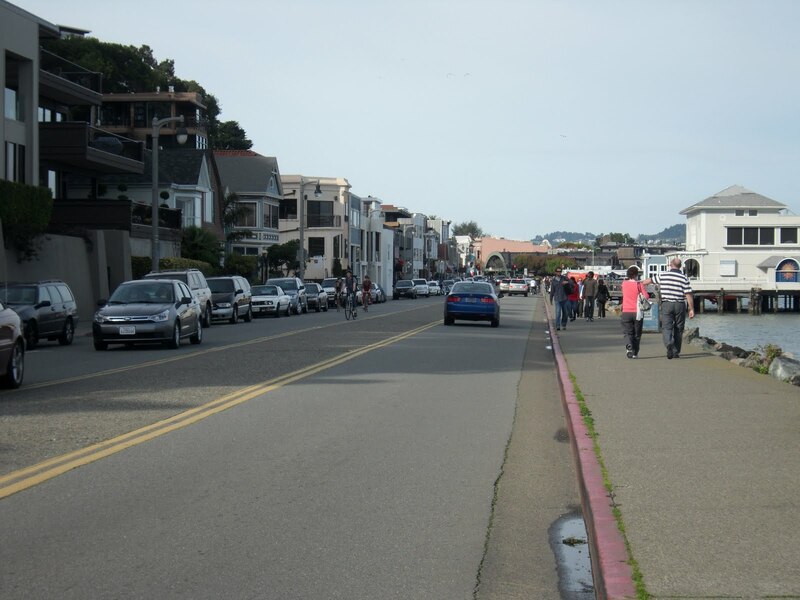 Not to worry, you’ll have more than enough momentum to coast on to Sausalito’s main strip. 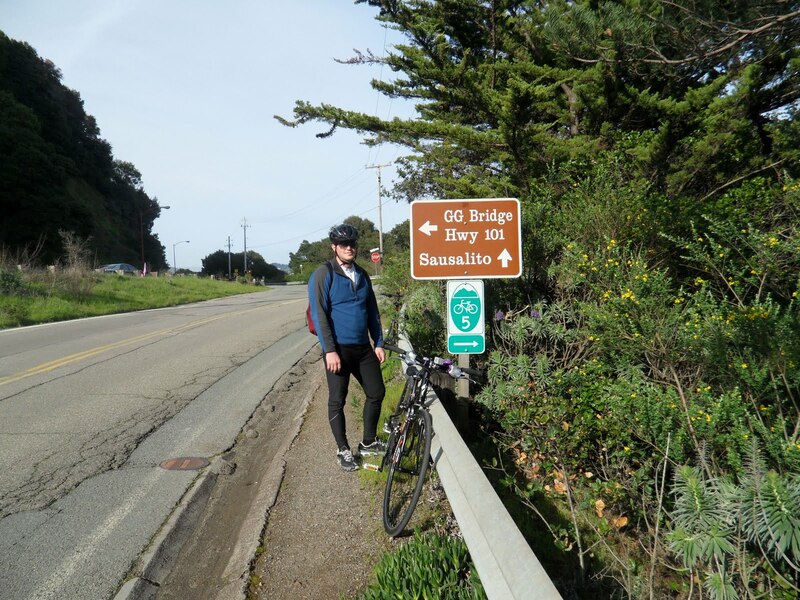 There’s something to be said for reaching your destination, or even the first check point along your Marin biking adventure. 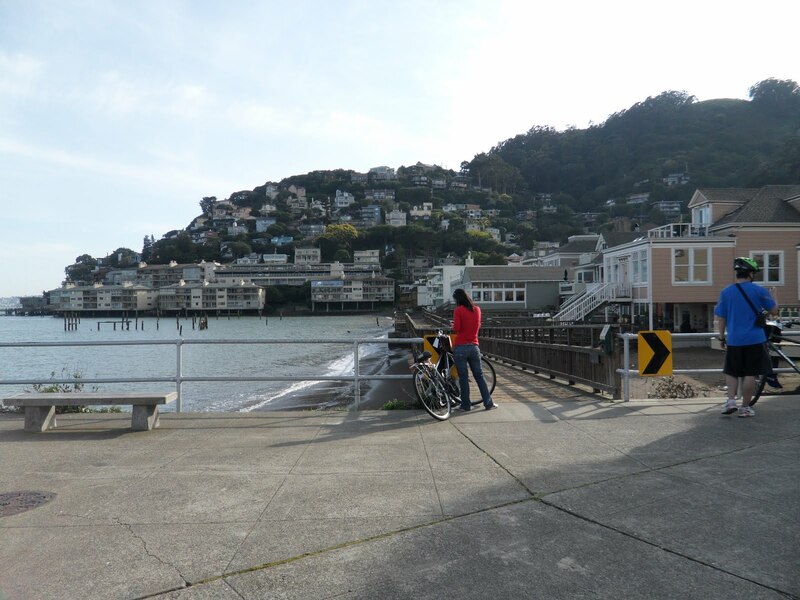 If the biking portion of your adventure is complete, Sausalito is a picturesque seaside town where there’s plenty of bike parking at the ferry terminal so you can explore unique boutiques and enjoy quaint (albeit sometimes pricey or touristy) restaurants. 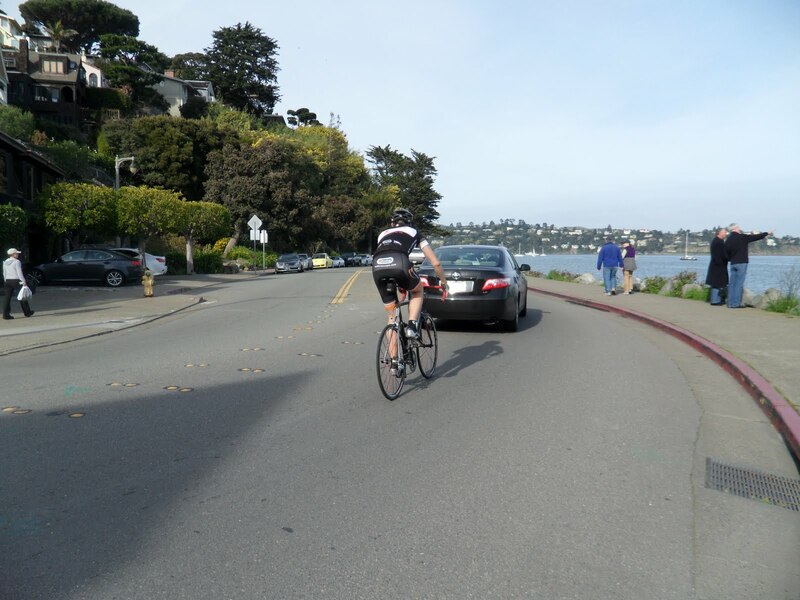 Sometimes motivation for some of those steep hills has been the promise of a superb wine tasting and in Sausalito at Bacchus and Venus located across from the ferry terminal parking lot on the main drag at 769 Bridgeway. 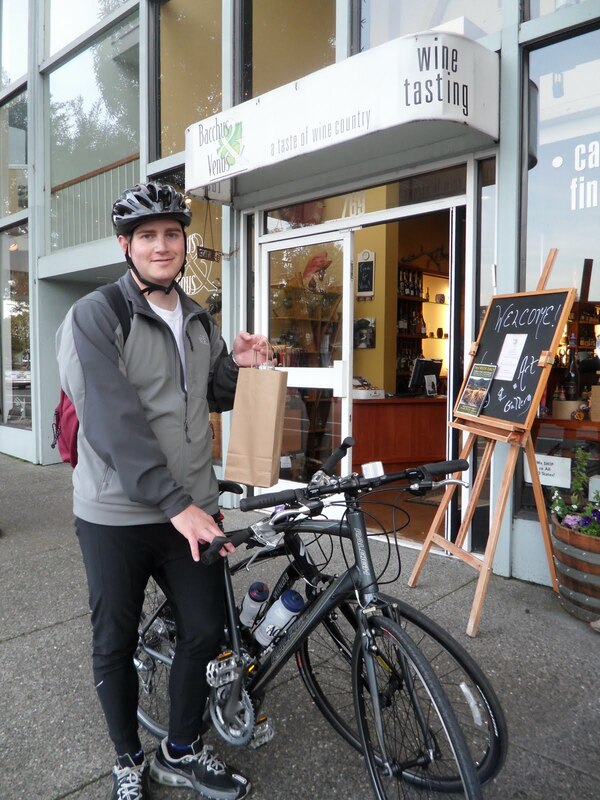 Whether you’re in the mood for one of their carefully crafted flights before boarding the ferry or want to take a delicious but reasonably priced bottle on board, Bacchus and Venus is one of our secret spots to hit along the bike trail. They’re happy to uncork your bottle and give you plastic drinking cups if you decide to bring your bottle onboard for the ferry ride home. Cheers! 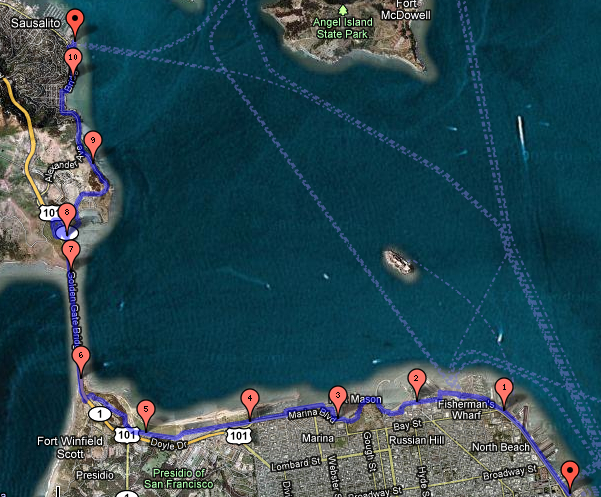 Having made it this far remember that you are FAR away and make sure you’re at the ferry WAY in advance. 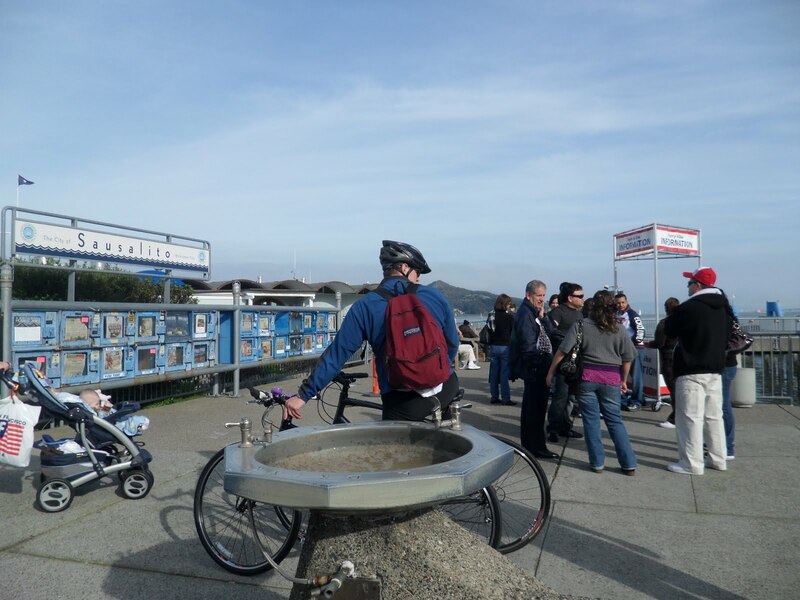 Blue and Gold Fleet have been known to turn down cyclists over regular ferry passengers and while you will eventually find a ferry that will take you, if you’re renting a bike you may not make it back for your return deadline. So get to the front of that line! 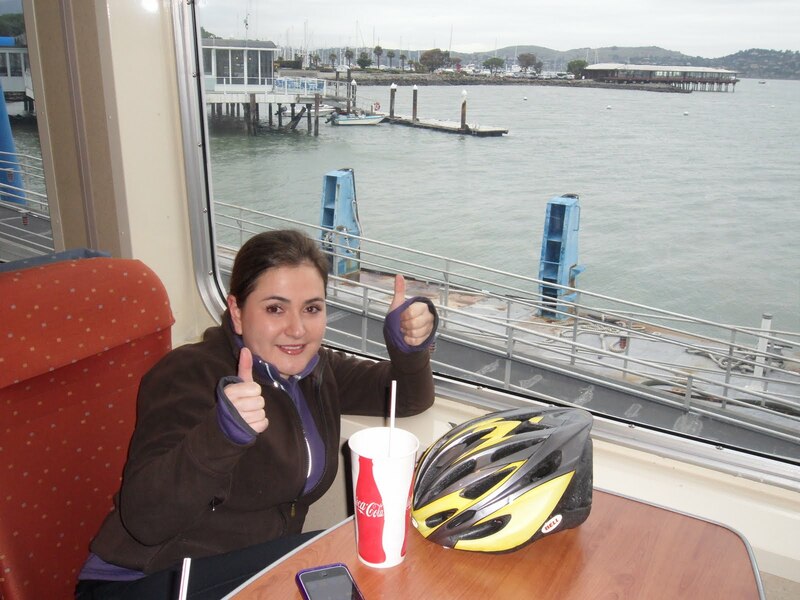 This is a photo of our first ride back from our trip across the Golden Gate Bridge. I couldn’t believe I’d made it. I felt like a rock star. 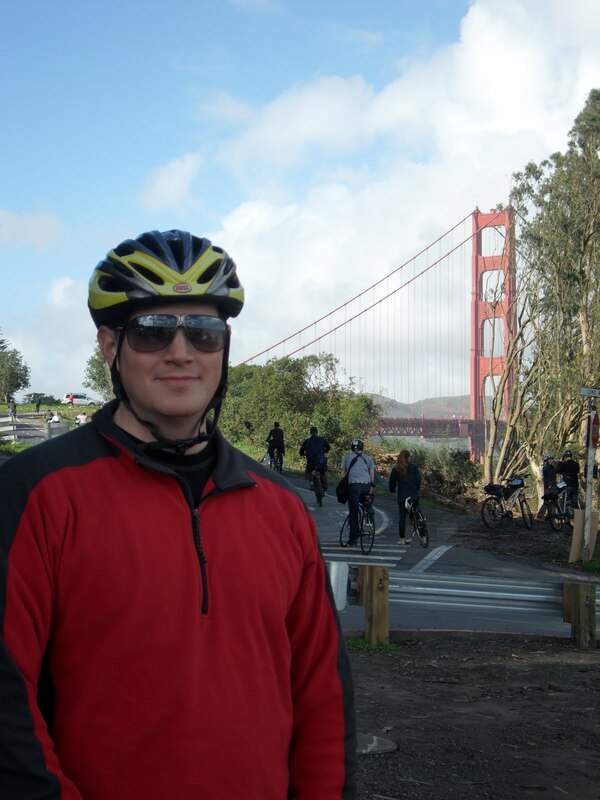 I now ride over the bridge an average of three to four times a week. 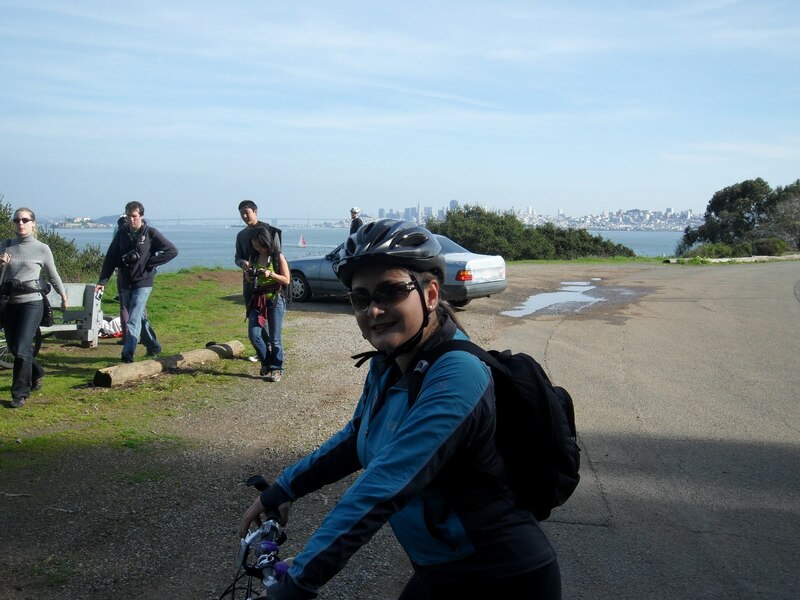 I guess we all start somewhere and this was the beginning of my love affair with biking. 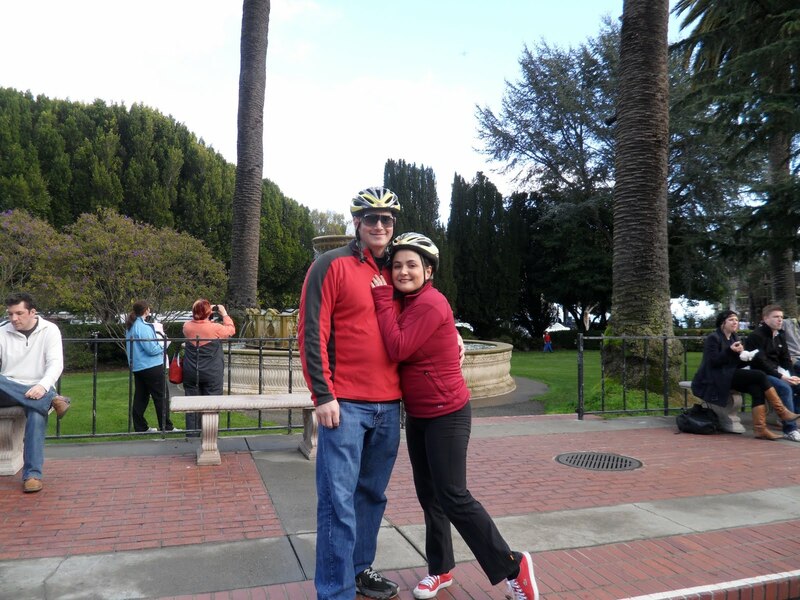 (And no, I wasn’t wearing high heals on this ride!) Hopefully you’ll go see what I mean . . .